Find out where to buy your copy. 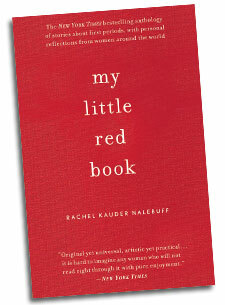 My Little Red Book is an anthology of stories about first periods, collected from women of all ages from around the world. Whatever a girl experiences or expects, she'll find stories that speak to her thoughts and feelings. My Little Red Book aims to provide support, entertainment, and a starting point for discussion for mothers and daughters everywhere. Royalties from sales of the book are being donated to charities promoting women's health and education. Let the dialog begin! My Little Red Book makes its TV debut! Watch me — along with some fun woman-on-the-street interviews — on the Rachael Ray Show (3/16/09).